I’m sitting in Restaurant Jardin de la Tour in Avignon, drinking a pink wine called Ouh La La! On either side of me are the lovely Saladin sisters, Marie-Laurence, who is 26, and Elisabeth, 24. To the vulgar of soul, this might seem like a hot date, but there’s work to be done. In a sense, what has held the region back in the quality stakes is the lack of focus of its old-style reds (red still accounting for the overwhelming majority of its production). We have been used to seeing Côtes du Rhône rouge as standard house red, the kind of wine that just tastes of French red wine, rather than anything more racy, spicy or complicated. There are those who reckon that, when producers have such a smorgasbord of grape varieties to choose from, the resulting wine can only be an indistinct blur.the grape’s the thingBlending has never prevented the red wines of Bordeaux from asserting proud regional identity, though, and nor need it here. And anyway, there may famously be 13 grapes permitted in Châteauneuf-du-Pape, but who uses them all? The great majority of reds I tasted in the region were blends of two or three grapes – usually Grenache and Syrah, with optional admixtures of Mourvèdre or Carignan. There’s Cinsault too, but a lot of that goes into the rosés. And here we come to the next great revelation, which is that Grenache is by no means the second-division variety the textbooks tell you it is. At least, it doesn’t have to be. When its natural vigour is curtailed by means of interventions such as green harvesting, when it is given cool pre-ferment maceration, and – best of all – where it comes from old vines, it produces stunning wine of inky concentration and the kind of gentle, gingery spice that can make peppery old northern Rhône Syrah seem a trifle crude. The brothers have pitched camp in Valréas because, as oenologist Paul-Henri puts it, “we feel the Rhône is more dynamic.” There’s confidence. They oversee 25ha of vineyards on clay-limestone soils, where the hillside plots (or devers) benefit from the Ponthias, the local name for the wind that comes off the Alps and mitigates the broiling southern sun. Everywhere, white wines are emerging from their traditional flat neutrality of style, so much so that more than one winemaker contrived to look a little baffled at the mere suggestion that these wines were once seen as relentlessly non-aromatic. Higher proportions of Viognier are the panacea, here as elsewhere, but when it achieves that honeysuckle lightness and freshness in the wines, it’s hard to argue. At the other end of the style spectrum, the Domaine de la Petite Bellane has a Valréas bottling, Les Echalas 2004, which is unblended, late-harvested, barrel-fermented Roussanne. Its deep sunny-yellow colour, waft of banana, and palate of buttery scrambled eggs is a brave pitch at the New World taste market, but one that, I’m bound to say, they have brought off in some style. In the vanguard of change are the likes of Bernard Pradier of Château d’Hugues, a painter-oenologist whose elegant, half-tone drawings decorate the labels of some elegant, beguiling wines. Where the wines didn’t impress, it was because that muddy old indeterminate profile predominated. Hardish tannins on a medium-weight palate, poor fruit expression and hot alcohol are not the way to convince the Australophiles that France has anything to say for itself.onwards and upwardsThe other big story of this visit was just how good the 2004 vintage is. The southern Rhône hasn’t really had a blooper in the present decade (with the possible exception of 2002), and the 2005 looks like living up to its pre-billing, albeit with long bottle maturation times absolutely mandatory. Meanwhile, the ’04s are drinking a treat, though the most carefully crafted reds will certainly repay keeping. Wines likes these are leading the way out of the house-red Rhône cul-de-sac, and towards the sunlit uplands of regional pride. First up is a garlicky creamed artichoke soup, and then red mullet done in a distinctly modern façon, with mussels, spring rolls and vermicelli. The rosé is a cinch with the soup, its delicate raspberry allure going full and weighty on the palate, although the various reds that have been brought to the party are all a touch too much with the fish dish. Our reward for getting through it all will be a glass of the Cave de Rasteau’s fine Signature, a vin doux naturel Grenache aged in both American and French oak, and possessed of all the sweet black cherry charm for which ruby port so vainly strives. The southern Rhône is a region in ferment. The tides of international wine fashion that began lapping at France’s southern shores in the 1990s have now washed this far inland, but whereas Languedoc producers went headlong into varietal labelling and southern-hemisphere tastes, here there are ancestral appellations to respect, for all that they begin with the very humblest – Côtes du Rhône. To the north are the aristocratic names of Hermitage, Côte-Rôtie and the rest, where money flows like Syrah, and international wine gurus dispense their annual benison like Santa Claus. Somehow, though, between the Condrieu and the Pays d’Oc Chardonnay, both stylistically and geographically, the southern Rhône – no mere enclave after all – is at last beginning to establish its own regional identity. Of course the south has always had its own local toff in Châteauneuf-du-Pape, birthplace of the appellation system and home to some outlandishly priced wines. My itinerary through the south almost superstitiously avoided Châteauneuf, though. What we were in search of was the best of what Côtes du Rhône and its various Villages (many of them like Valréas, Rasteau and Cairanne now separately designated on the labels) can offer. 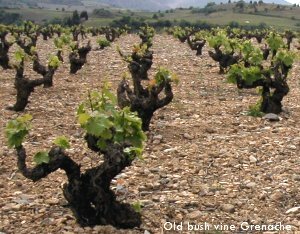 There is masses of old-vine Grenache in the southern Rhône. Producers who are selling their wines for barely more than a fiver in the UK are able to draw on plantings that are the venerable elders and betters of all that eight-year- old Merlot in the Languedoc. 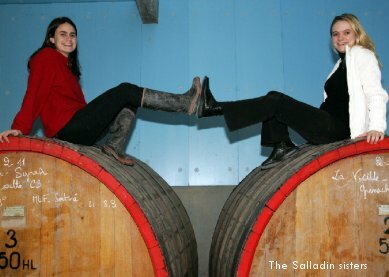 Those Saladin sisters, who have just taken over the running of their Domaine from Papa, have vines up to 90 years old. Their youngest red vines are in their thirties. The results of this burgeoning self-respect can be stupendous. The Domaine des Grands Devers was acquired in 1999 by four brothers from Burgundy, scions of the Bouchard line. Even more extraordinary are the reds. The Enclave des Papes 2004 (Valréas was a loyalist enclave during the Avignon papacy) has a gorgeous, dusty paprika nose, astringent but manageable tannins, and great depth for a simple Côtes du Rhône. The Valréas 2004 undergoes a longer vinification, and has only 60% Grenache to the 80% in the Enclave. The juicy black plum nose is so inviting, and its beautifully rounded, sweetly ripe body and creamy finish are so enthralling, I want to drink it, right here, right now, in a dusty little caveau at 9.30 in the morning. Not the least astonishing aspect of both of these reds is that neither of them has seen so much as a splinter of oak. A powerful pink, Rosé du Vent 2005, is 90% Grenache, and full of fleshy, peachy fruit. His Cuvée Sylviane 2004 is intensely raspberryish, with supple, integrated tannins and is a simple Côtes du Rhône, while its richly oaky cousin, L’Orée des Collines 2004 (which has spent one year in barrel), takes the newly designated Villages name, Massif d’Uchaux.